Just the excuse we needed to buy a can of Pringles. We're always happy to find an excuse to buy potato chips -- especially Pringles (even when they taste like French toast). And the DIY website Instructables just gave us an interesting one: cooking hot dogs. The idea of cooking hot dogs in unusual ways might sound vaguely familiar (and mildly unappetizing) if you were paying attention in elementary school science class. Essentially, it's a lesson in solar power cooking. School books suggested harnessing the power of the sun to cook your dog by rigging a parabola lined with aluminum foil. But Instructables makes it even easier -- and a little more delicious -- by fashioning one out of an empty Pringles can like so. 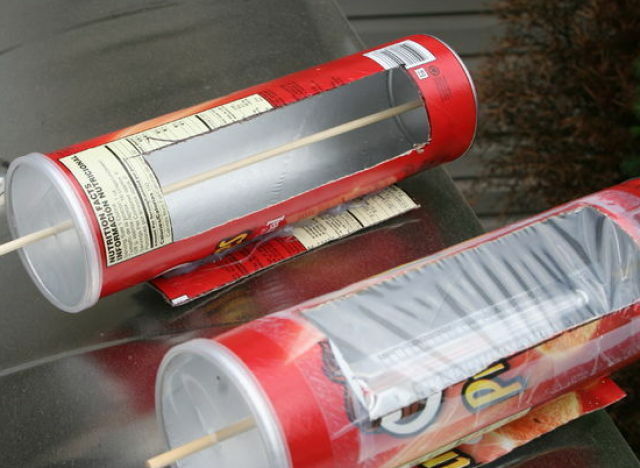 On a semi-hot day -- around 80 degrees -- the Cats Science Club over at Instructables said they were able to get the Pringles can up 170 degrees. While the idea of eating a hot dog cooked in a Pringles can doesn't sound all that awesome, at least you get to eat the Pringles first, right? See how they did it and decide for yourself if you're up for the challenge.